As I think everyone knows by now, in March I'm quitting my job in Okaba to take over Yes! English School in Sanda. I'm very excited and a little nervous as well, but I have a feeling this is going to be the start of something great! I've started a new blog for the school which will eventually have news and updates, but for the moment it's still unfinished. You can check it out if you like at the link below. Also the school currently has a website, so anyone who is interested can check that out too. There are lots of cute pictures of the current teachers David and Nadia (who some of you may know from Nihongo Salon), their baby Tom and the Yes! students. 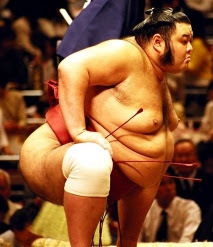 I just called the Sumo Association this morning and ordered 2 sets of tickets for the March Tournament in Osaka. It's gonna be so sweet! I love going to the sumo, and this year my Dad and his girlfriend are going to come with me, Yeah! (Also my friends Hana and Shu-shu, and my fellow Nova-ers Bec and Dr. G. Wassup! Sumo in da hizzouse! P.S.- This picture was the first result on a GIS for 'sumo' and shows Takanotsuru, one of the famous muttonchops twins, who, alas, has retired.